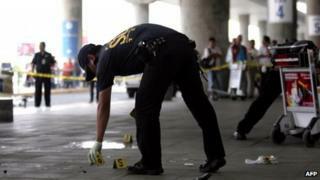 Gunmen have shot dead four people, including a mayor, at Manila airport in the Philippines, officials have said. Ukol Talumpa, mayor of the southern town Labangan, and three others were hit while waiting outside the airport terminal. Gunmen approached Mr Talumpa and shot him and three others at close range, airport manager Jose Angel Honrado said. The attackers then escaped. The motive behind the shootings is unclear. Manila's Ninoy Aquino airport handles international and domestic flights and was crowded at the time of the shooting. "The mayor and his family and some security escorts were attacked," Mr Honrado said, adding that the mayor's wife was also among the dead. "Government agencies are trying their best to determine the perpetrators and bring them to justice," he said. The other two killed were a one-year-old boy and a 25-year-old man, AP news agency reported. Four other people were reportedly wounded in the shooting. The gunmen fled the scene on a motorcycle, Mr Honrado said. Police investigators were considering political rivalry as a possible motive for the attack, The Philippine Star newspaper reported. Local media reports said Mr Talumpa had survived two attacks before: an ambush in 2010 and a grenade attack in 2012.